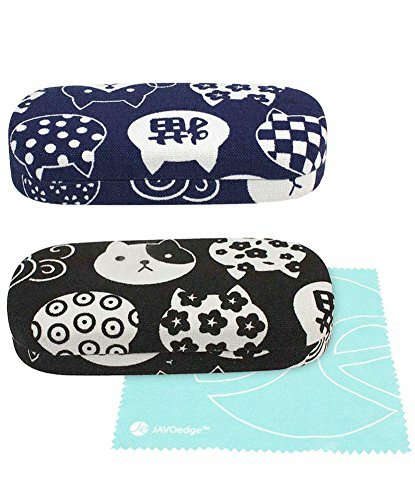 Protect your eyeglasses in this large eyeglass case featuring a cat print. This hard-shell, structured eyeglass case is lined with fabric on both the exterior & interior and features a cat print. The interior is lined and will not scratch up the lenses. The case fits larger sized glasses. The eyeglass case does not take up much room in a purse, or when stored on a bathroom counter. The micro fiber cleaning cloth is a safe way to keep your glasses clean from smudges, dust, and fingerprints. Protect your eyeglasses and store them in this large cat patterned eyeglass case. PROTECTIVE: Includes 2 QTY x Eyeglass case [Blue, Black]. A great value without compromising quality. Protect your glasses and keep them clean and clear. DURABLE: Made with a hard exterior shell that is lined on the exterior & interior with fabric to protect against falls, scratches & dents. The case provides excellent protection while being lightweight and easy to carry. CLASSIC DESIGN: Perfect gift ideas that are fashionable for Men, Women & Children. Select from a variety of colors options. SIZE: 6.3" x 3" x 1.6" [LARGE SIZE CASE]. Perfect for Large or Medium Sized Sunglasses, Eyeglasses, Reading Glasses.